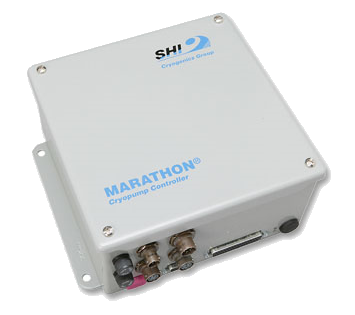 SHI’s MCC enables fully automatic operation of Marathon® CP Cryopumps. Industry standard cryopump protocol is delivered via RS-232 interface from the customer’s host computer, PLC or Windows-based PC (using optional SHI MCS Software). Automatic operation and regeneration, as well as monitoring of critical system functions, are enabled, resulting in improved process times, enhanced efficiency of the user’s process and greatly reduced downtime between production cycles. In conjunction with the MCC, Marathon CP Cryopumps are enhanced with all necessary automatic valves, vacuum and temperature instrumentation and blanket heaters to enable safe and efficient automatic operation and regeneration.